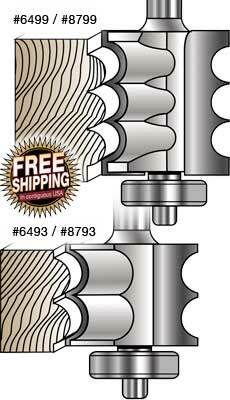 2 flute, carbide tipped with totally enclosed ball bearing guide. Perfect for early American and period furniture. 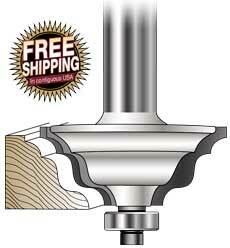 Also used for decorative edges, such as moldings, chair rails, drawer fronts, casement work, and paneling. 2 flute, carbide tipped. Use for decorative edges on moldings, picture frames, etc. Reminds me of an Art-Deco type of style. I used it for some wall moulding for my home theater. Makes a beautiful edge! 2 flute, carbide tipped with totally enclosed ball bearing guides. For decorative edges on moldings, tables, mantels, picture frames, etc. Also use for panel edging. 2 flute, carbide tipped. One or more beads can be cut in one pass. 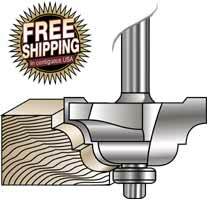 Used for decorative edges on moldings, picture frames, furniture, etc. Bits come with totally enclosed ball bearing guides. Bits cut beads having a 1/4" diameter. 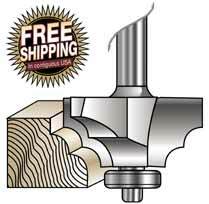 2 flute Carbide Tipped with totally enclosed ball bearing guide. 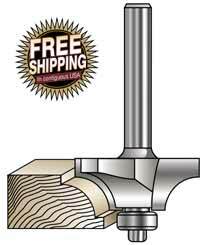 Ideal for fluting and decorative grooving of edges. Introductory Sale: SAVE $9.00! 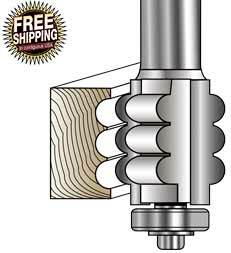 2 flute, carbide tipped router bit with totally enclosed ball bearing guide. Use to make decorative edges on moldings, tables, picture frames, etc.